I've been looking at this pile of watches for months now. I knew what I wanted to do, but life and to-do lists and, well, time, kept getting in the way. So, today it is. Ironically, today is also the two year mark since the owner of these watches passed from this earthly life into the heavenly one. You see, these watches...all of them...belonged to my husband's grandmother, Shirley. 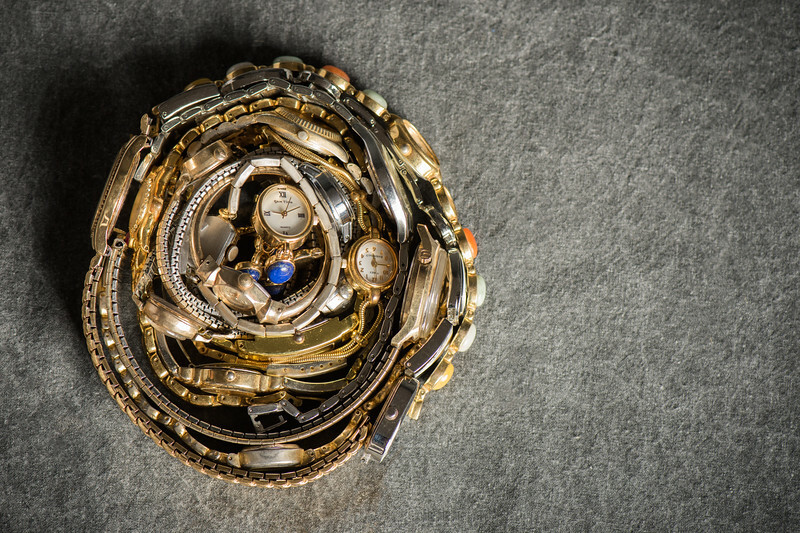 This blog post story ponders the story of these watches, questions possession, and reflects on how to give objects new life. The average watch battery that comes with your watch lasts for 4 years, according to Time Centre. At 18 watches pictured above, that equals 72 years of ticking time. Let's assume that Shirley received her first watch at the age of sixteen. She died at the age of eighty-eight, 72 years later. Its certainly something to ponder. 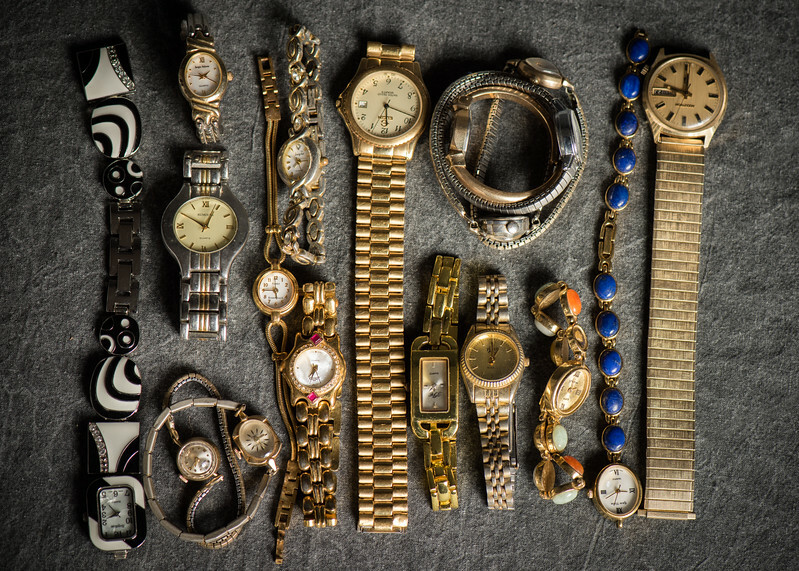 Of course, its hard to tell when Shirley's watch collection began. There doesn't actually seem to be one in the pile from 1944, when she would have been 16. So, my math doesn't actually make sense. Our watch purchases don't always follow battery life. We receive watches occasionally as gifts even if the one we're using still works. We have everyday watches and our "nice" watch. So, we can't assume that these watches were occupying separate years of Shirley's life. However, I guess that most of these had a battery run out and rather than replace it, she purchased or received a new one. After all, styles certainly do change in 72 years time. I like to look at those changing styles above too. I like the black and white "fashion watch" on the far left and the blue beaded one on the farther right. There are also several bracelet watches that have some stretch to them that would have been more stylish and feminine for a younger Shirley's wrists. There are the functional every-day watches that I picture her wearing in the middle of her teaching career, checking to see how many minutes were left until she needed to get students to the lunch room or until the end-of-day bell if the students were especially rowdy. There are the ones with a wider band that I wonder if she used when she got a little older and needed a larger watch face as she strained to see the numbers. I can ponder the story of these watches, but the questions I get to ask are almost more fun than any answers I'd ever receive. Its a neat way to look at the life someone had - so visual and personal. I know I always have a dilemma about things that are slightly broken that I could fix if I had the time or resources. I am sure Shirley had that in mind too. Rather than toss the watches with broken clasps, Shirley kept them, probably always intending to get that clasp fixed so she could wear it again. As time passed, they were tossed into her jewelry box and she probably didn't realize how much they had accumulated. 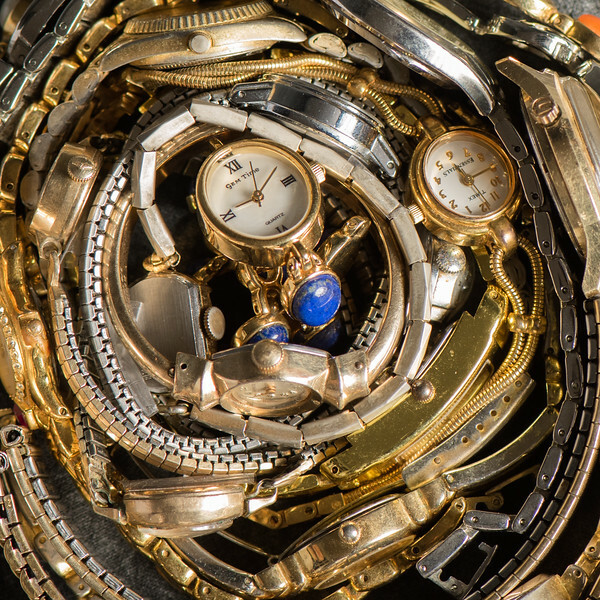 I can't help but consider the abundance we live with when I felt the weight of these watches in my hands, carrying them to the table to position them. I think of what my watch accumulation would look like if I had kept more of mine at this point in my life at the age of 35. I also can't help but think about a story I remember from a college photography course. I remember the image of a watch whose hands had stopped after the Hiroshima bombing in World War II. I can't find the exact image online, but there are many such watches whose time stopped as lives stopped and horror was witnessed that day. But, I did come across this unique story about a watch whose hands flew off as it was 1500 yards from ground zero in the Hiroshima nuclear bombing. Its hands flew off but the were first fused into a position of 8:15. This is the only uncovered watch with a story like this. Shinji Mikamo and his father were together when the bomb hit. They struggled together to get to the river to try to cool their burning bodies. They ended up being separated in make-shift hospitals. When 19 year old Shinji was better, he came back to the rubble pile that had been their home. 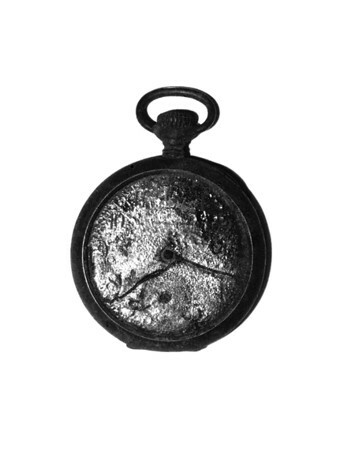 A flash of light caught his eye and he came across his father's silver pocket watch. In that moment, he knew his father was gone. He had already lost all family and he was totally alone. Shinji later donated the watch to the Hiroshima Peace Memorial Museum. When he donated the watch to the museum, Shinji said, “I’d held the watch close, thinking of my father and his bravery”. His daughter's account continues, “I was ready to let go of this only keepsake I had of my father ... as a reminder of both the destruction and the heroism that were displayed that fateful day." When it was on loan to the United Nations and touring through the United States, the watch was stolen and has never been recovered. You can read more of the story HERE or a more complete story here in Rising From the Ashes: A True Story of Survival and Forgiveness from Hiroshima by Shinji's daughter, Akiko Mikamo. I nested those watches together. It seemed the perfect thing to do. The tiny bracelet ones were so compact compared to those larger-faced watches. They layered inside of each other like the cross-section of a tree...or like a nest. A nest seemed a good metaphor. Our watches are these items that help us organize our lives so we can complete necessary tasks and take care of the ones we love, running them to practices, making it to an after-work meeting on time, taking our parents to their doctor appointments as they age. These items that are so personal to our tending to others seemed perfect for a nest, a place where we incubate and care for our loved ones until they are ready for more. So what do we do with objects like these? A few might be able to be repaired with a new battery (if they aren't corroded). I saw an idea on Pinterest where one could make a bracelet out of the old watch faces, which could be good if more of these were of the same size or shape. I found another example where one could put photos inside of the watch faces and turn them into bracelets and another where you could make an art piece and place it inside of the watch face. I found one other one that would be great with really old watch faces where you make just the metal plate into a necklace that has a 1920s feel. They're all quite inventive and resourceful. I'm not sure what I'll do though. They are calling out for something. I just don't want to put them in a drawer and forget about them. 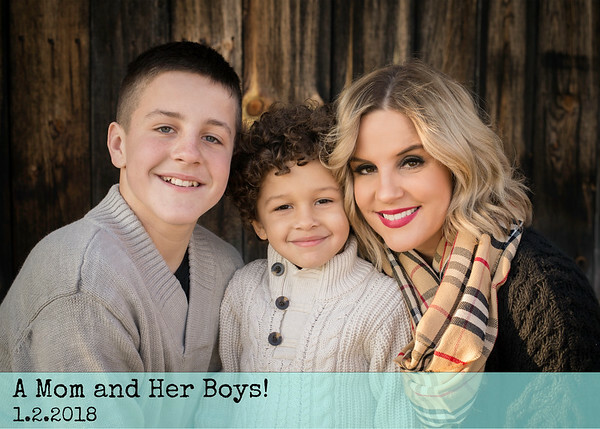 If you'd like to see a sample of my other posts, check out my previous post titled A Mom and Her Boys! Telling personal stories is an important component of my photographic work!